Will The Brits Muddle Through? Two of the most perilous military operations are crossing rivers while under enemy fire, and retreat while engaged with enemy forces. Britain’s embattled Prime Minister, Theresa May, must accomplish both maneuvers if she is to extract her very confused nation from the horrid Brexit mess and save her job. We wish her lots of luck. On December 11th, British members of parliament must vote to accept some sort of Brexit deal; a negotiated withdrawal and/or trade association. But there is bitter opposition within May’s Conservative Party and rival Labour Party to Britain’s withdrawal from the European Union. The rump Northern Irish Unionist Party, which shores up May’s Tories in parliament, is making everyone crazy. 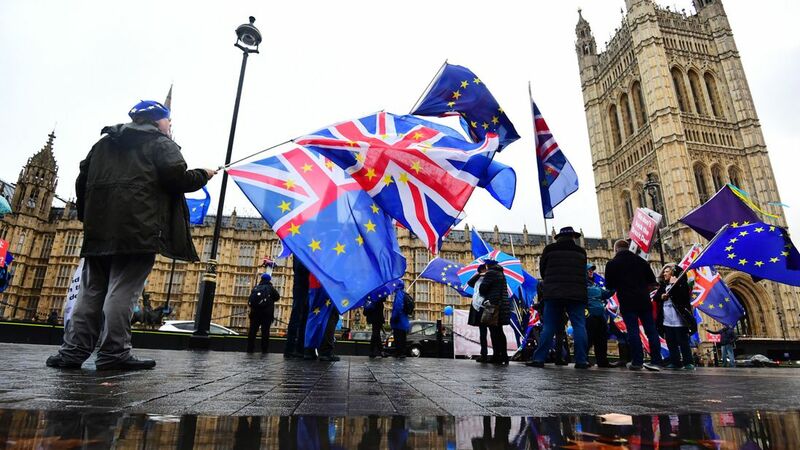 Increasing numbers of British voters now think that the original referendum to withdraw Britain from the European Union after four decades of grudging membership was a catastrophic mistake. Britain was one of Europe’s big three members; without with EU, Britain will be marooned somewhere off the coast of northern Europe and forced to become totally responsive to US demands and policies. Equally vexing, the proud Brits, who a century ago ruled a quarter of the globe’s surface, will be forced to see old rivals Germany and France become the undisputed kingpins of Europe while no one pays attention to the toothless old British lion. British supporters of Brexit don’t care. They tend to dislike foreigners…aka ‘bloody wogs’…, chafe at regulations imposed by faceless bureaucrats in remote Brussels, fret over a rising tide of EU immigrants, fulminate over the steep costs imposed by the EU, and deeply resent being compelled to accept working in the EU collective instead of trumpeting imperial demands. But times and economic realities have changed. Britain is no longer the manufacturing powerhouse it was before World War II. Its industries are rusting, the quality of its manufactured products questioned (Dyson excepted) and the once mighty financial power of the City of London diminished. Europe’s money lenders and their ilk are slinking off to Frankfurt and Paris; the City of London is no longer the wild, anything goes casino where all sorts of financial chicanery was quietly tolerated. London is slowly losing its charmed existence as a tax refuge – or to quote Somerset Maugham’s great quip about Monaco, ‘a sunny place for shady people’. As Britain’s economy deflates under Brexit, its working class will have refuge against the snobs and toffs who sneered at them for generations and perpetuated the class system. But ditching the EU will be like Britain shooting itself in the foot. All economic signs show that Britain will be impoverished if Brexit happens. Everything – the stock markets, industry, trade, housing – are pointed downhill. Divorcing Britain from the EU will be nightmarishly complex and fraught. The Bank of England warns that Brexit will plunge the country into a serious recession. All this for the sake of national ego and a chance to stick it to the ‘bloody foreigners’. Certainly not worth the expense or national anguish, say many sensible Brits and the Labour Party. The Tories are split over the issue and locked in bitter infighting. The leading Conservative MP’s remind one of all the things we didn’t like about snobby, imperial Britain. The way out of this nasty mess is for Parliament to do its job and mandate another referendum. Many pro-Brexit voters misunderstood the real issues and regret their hastiness. Divorce is always ugly and painful. After all the shouting and name-calling, Britain will be left with a cup of cold flat tea, not the golden chalice it hoped for. Award-winning, internationally syndicated columnist, writing and commenting for the top media outlets of the United States, Canada UK, France, Gulf states, Turkey, Malaysia and Pakistan.